Edmondscote Athletics Track's car park could be used as part of Warwick District Council's parking displacement strategy while the Covent Garden car park in Leamington town centre is rebuilt. Edmondscote Athletics Track’s car park has been earmarked as a site to provide temporary spaces as part of Warwick District Council’s plans to build a new headquarters in Leamington. Under the council’s Local Plan for thousands of houses and attached infrastructure across the area, the track has been earmarked to make way for a country park and to be replaced by an new sports facility on land to the north of Myton School. But, in the meantime, the council is considering using the track’s car park temporarily as part of its parking displacement strategy which it wants to implement in its wider project to build a new car park and headquarters on the site of the Covent Garden car park in the town. 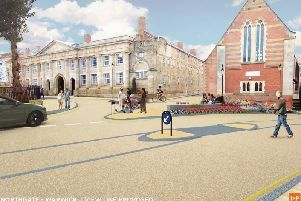 The council and BID Leamington, which represents businesses in the town, have appointed transport management specialists WYG to review the draft parking displacement proposals. And WYG has concluded that while the displacement plan would replace the loss of 468 spaces from Covent Garden in full, there would be an imbalance between short and long-stay provision. It has also highlighted the change to the geographical distribution of parking with limited displacement capacity available in the north of the town centre. It is estimated that the Edmondscote car park could add around 80 spaces to the displacement plan. The council is also considering implementing a park-and-ride scheme from Warwickshire College during Christmas 2019.